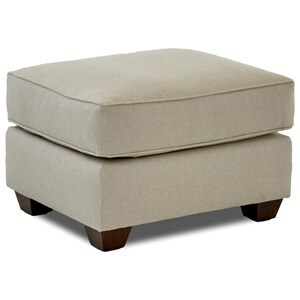 This ottoman and upholstered chair set provides the perfect place to curl up with a book or magazine. 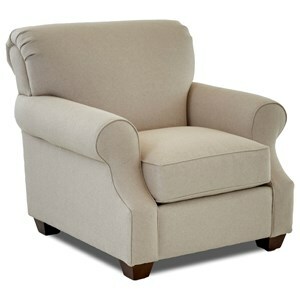 You get a taste of elegance with the tightly upholstered rolled back featured on the chair. The scooped arms are also rolled, adding graceful flair to the chair. The high resiliency foam seat cushion ensures lounging comfort. The Olivia Casual Upholstered Chair and Ottoman by Klaussner at Value City Furniture in the New Jersey, NJ, Staten Island, Hoboken area. Product availability may vary. Contact us for the most current availability on this product. K68500 OTTO Ottoman 1 29" 22" 21"
K68500 C Upholstered Chair 1 40" 43" 37"
The Olivia collection is a great option if you are looking for Casual furniture in the New Jersey, NJ, Staten Island, Hoboken area. 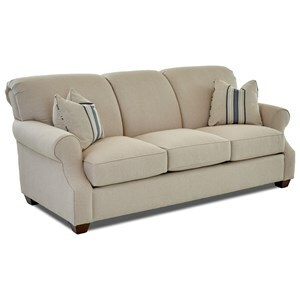 Browse other items in the Olivia collection from Value City Furniture in the New Jersey, NJ, Staten Island, Hoboken area.